The girl who learns the world by eating it. Kimchi Cha-Shu Ramen at Ramen Dojo. “Dojo” is a Japanese term that means “place of the way”, often referred to a formal training place for a practice to forms of arts. 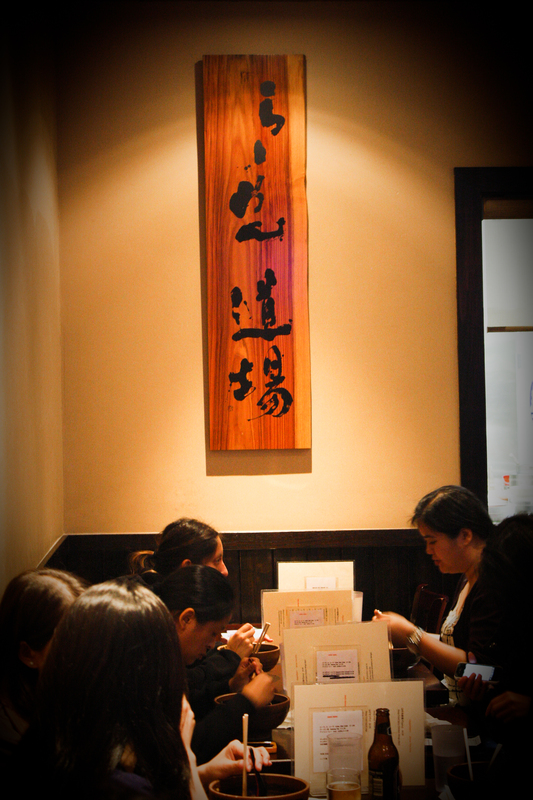 At Ramen Dojo, this would be where the chefs practiced, and we observed, the art of the slurpy noodles. The first lesson at Ramen Dojo was that of patience. With a shop this size and the fervent fan base, the average wait time was about an hour to an hour and half. Adult beverages a block down at a dive bar ironically named Yuppie definitely helped us through the process; but the more devout stood brave in the cold. The restaurant was a small, cozy one. It was warmly lit, with tables and chairs enough for only 20, while an L shaped counter top allowing an additional eight, also conveniently carved out the register section. Parallel to the front door was the entrance to its kitchen, a small cave of florescent light and steaming pots of broth. Chefs working away cooking noodles and adding toppings to the giant bowls. 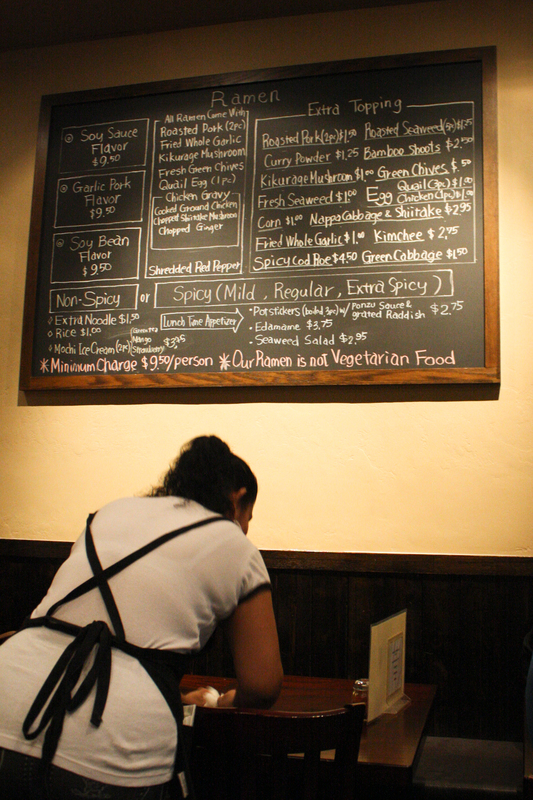 It was almost like a made-to-order sandwich shop or pizzeria: select your basics and add to your liking. 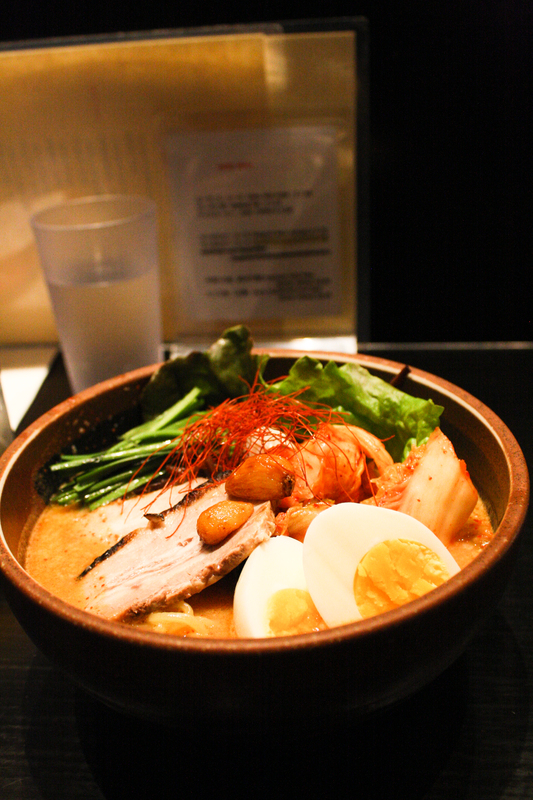 The ramen come in three broths of soy sauce, garlic pork, and miso, at three degrees of spiciness, and the garnishes of sliced pork, quail egg, roasted garlic, greens and saffron. 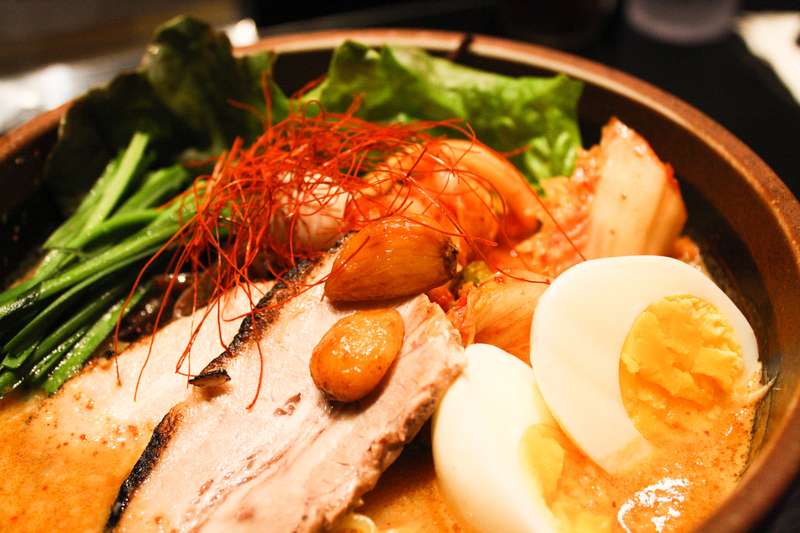 Available toppings included boiled egg, bamboo shoots, corn, kimchi, and many other standard favorites. What made me gleeful was their giant slogan: “Our Ramen is not Vegetarian Food”. As ramen broths were often pork based, I appreciated the declaration. Before we were seated, we were inquired if all four of us will be having ramen. Which probably allowed them to prep the noodles in time, so that when we ordered they would only need to add broth and toppings. That was the second lesson: organized assembly. Efficiency was nice, but definitely added a more nervous atmosphere. 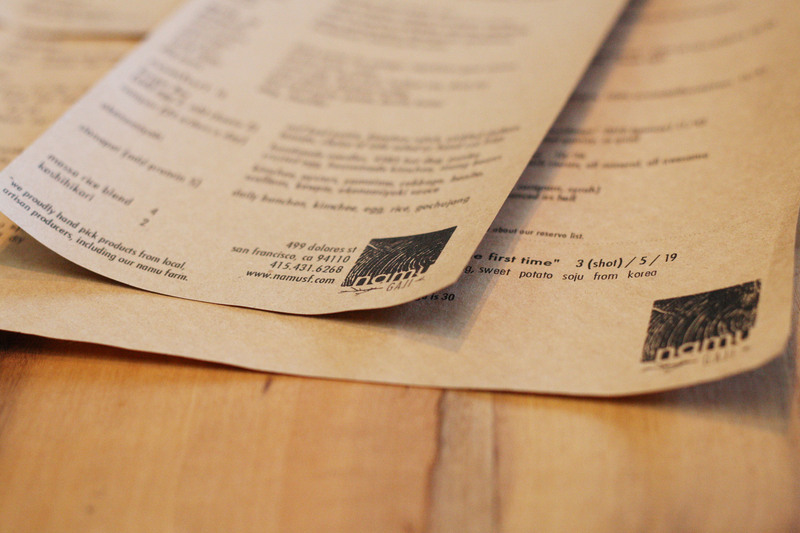 The waitress stood glaring while we giggled our way through the menu, pressured to think fast. 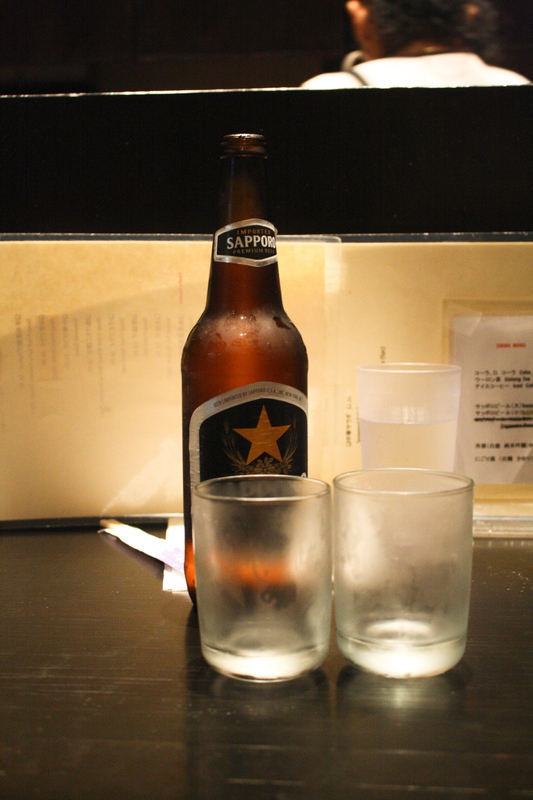 We ordered a round of beer just to buy a little bit more time. But these tiny tests to our dedication came with great reward, the reward being our bowls of ramen. 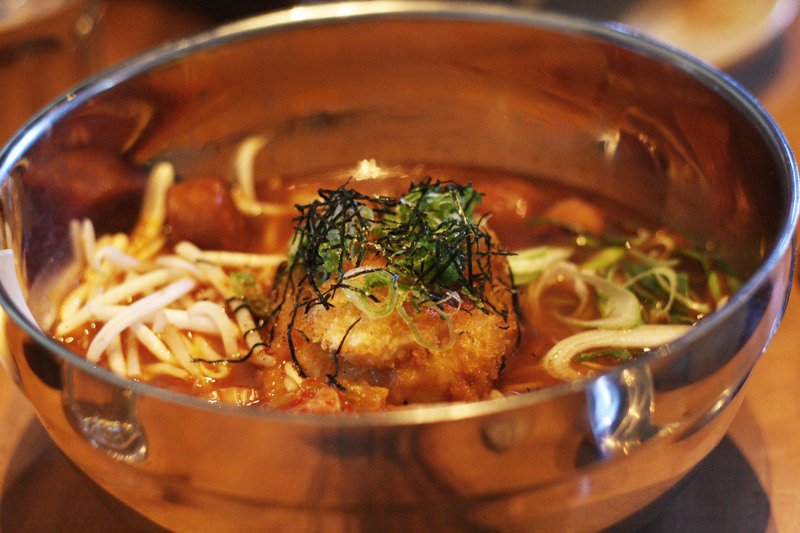 Ramen Dojo had been on the way of ramen and back a few times, the wait was not for naught. First of all, it was one of the most beautiful ramen I had seen. The bowl was filled with a gold richness containing tiny red flakes; steam rose through the pile of noodles and garnishes seducing our olfactory senses. The toppings were nearly piled, faced up with a wink. A tiny bunch of saffron acted like the ethereal red bow on the head of a brunette beauty, creating an airy structure to the image. I had chosen the miso broth, which was rich and warmed the soul. The sliced pork was beautifully marbled, with just the right amount of fat-to-muscle ratio, its flavor deepened by the char. Tanginess of kimchi helped cut through the thick broth, giving away a crunching texture against the egg’s softness. Meanwhile, packed full of harvest’s eve, the roasted garlics melted like butter at my bite. But the most wondrous for me were the noodles. Too often had I tasted noodles al dente at first but soon succumb to the power of the broth and sag into a sop of sadness. 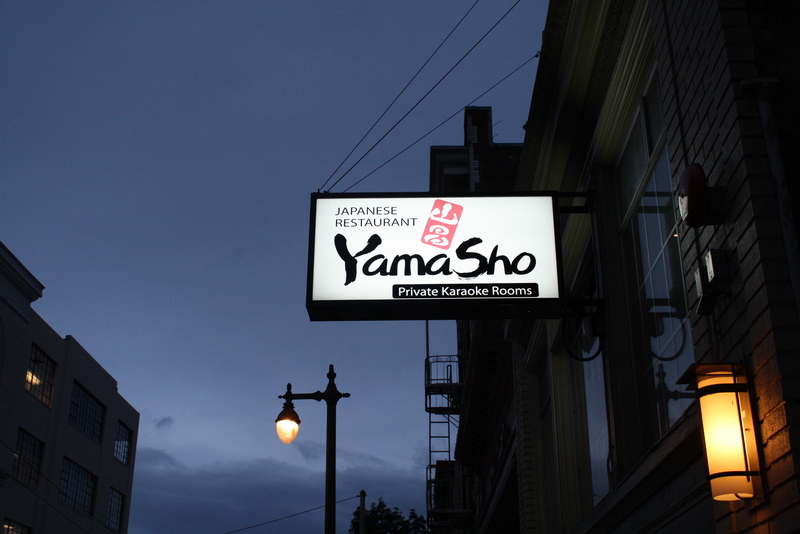 Not at Ramen Dojo, where their noodles were properly trainer to the way. It was almost reminiscent of spaghetti in firmness at first bite. Five minutes in, however, the ramen noodles came to life and became one with the broth: it was springing yet light, while the broth clung to their curves coating it was that extra pack of flavor. It danced. Like the noodles at Ippudo I’ve tasted, but in a meatier symphony this time. And life was amazing. I resurfaced twenty minutes later, tiny beads of sweat gathered on my forehead, face red and shone. The last bits of broth laid at the bottom of the bowl, last smoke of steam waving for me to consume it. My stomach was close to bursting, but somehow, my hands moved as if with minds of their own, and held the bowl up high so I could devour even the last drops of delicious soup. It is here that I learnt my third and final lesson at this place of the ramen way: there was no such thing as self-control in front of the ultimate deliciousness, such as this bowl of divine ramen. Hidden next to the always-busy Bi-Rite was this little hard-to-spot eatery. 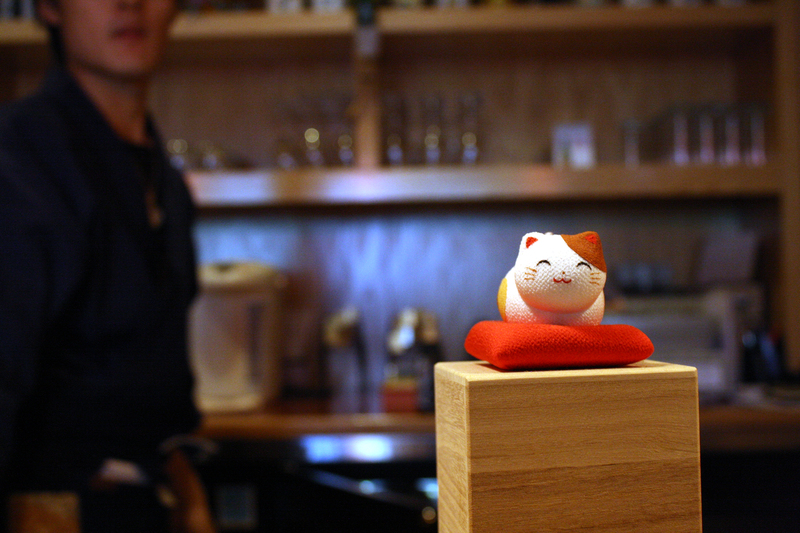 Namu Gaji, the rebirth of Namu back in Inner Richmond, had opened shop by Dolores Park in mid-April. 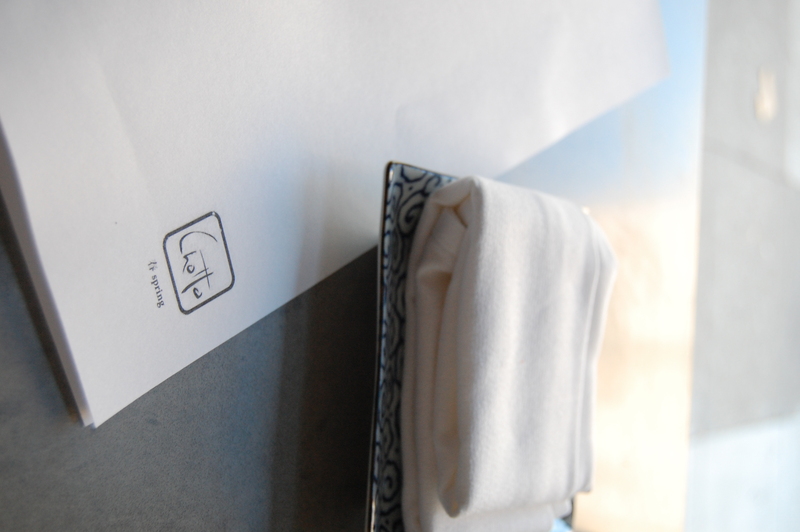 The long rectangle space with an open kitchen and neatly stacked wooden tables tout Korean and Japanese style cuisine. Their produce sourced from local farms, including their very own. 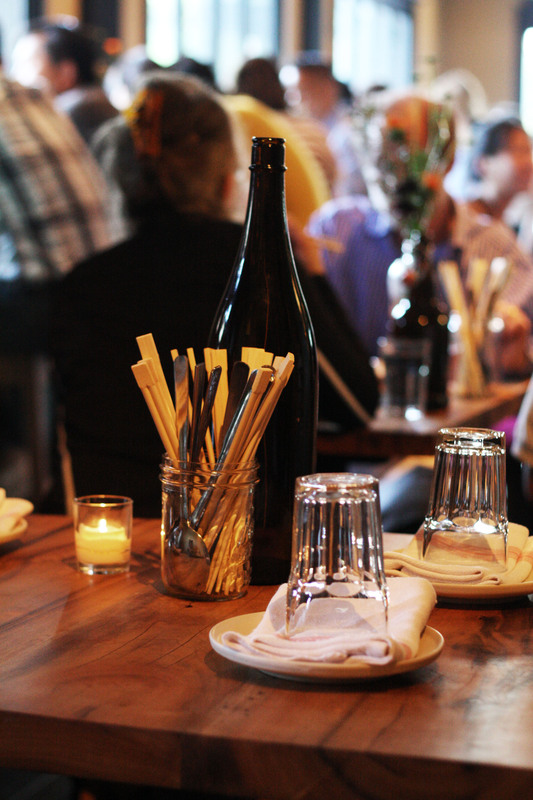 And the decor somehow reflects it: clean, rustic and unassuming. The menu was categorized by preparation: broth, salad, crispy (fried), grill and ‘comfort’ – the belly-warming carby delights. While we were surveying the menu, the restaurant brought on small pickled vegetable assortments for our enjoyment. 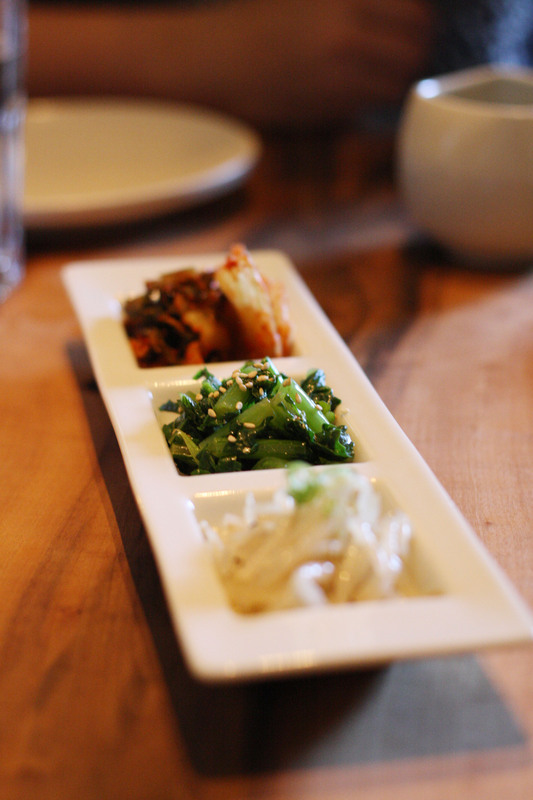 Kimchi, sesame tossed Chinese broccoli, and bean sprouts; all house-made. The kimchi had a nice texture, though missing the customary sweetness comes from Asian pear (often used in the kimchi-pickling process). We started with a really lovely raw dish. The sliced scallops arrived on a glass plate looking like a neatly painted flower. It was a petit symphony of flavors. Tangy and sweet from the tangerine slices, sparks of heat from the red pepper. Sliced battera konbu gave way to a reminder of the ocean, all while the sliced scallop – trembling at touch then soft and embracing at taste – set up the perfect envelope for all the flavors. It was clean and vibrant like the first sunny day at sea. 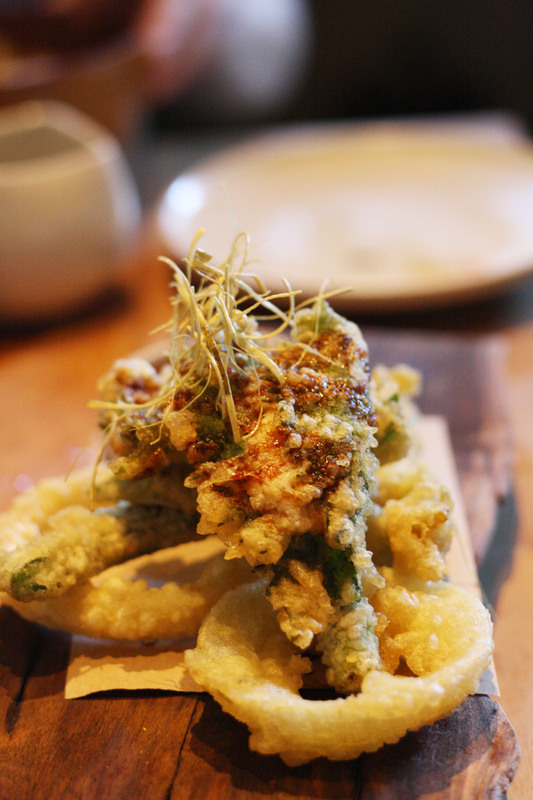 Following the raw we had a crispy: fried uni wrapped in shiso and other tempura vegetables. Uni and I had been faithful for years, oh you yellow spoonful of the ocean’s essence. Any time, any where. If there is uni on the menu, I will order it. Uni and fois gras, but I digress. Yet this dish, with all my passionate hopes, had failed in the use of uni. I could barely taste it. Overpowered by the shiso, the batter, and the sauce atop – and probably fried for a bit too long – the uni became faint and shriveled. $12 piece of sadness. The ‘onion rings’ were nice though. 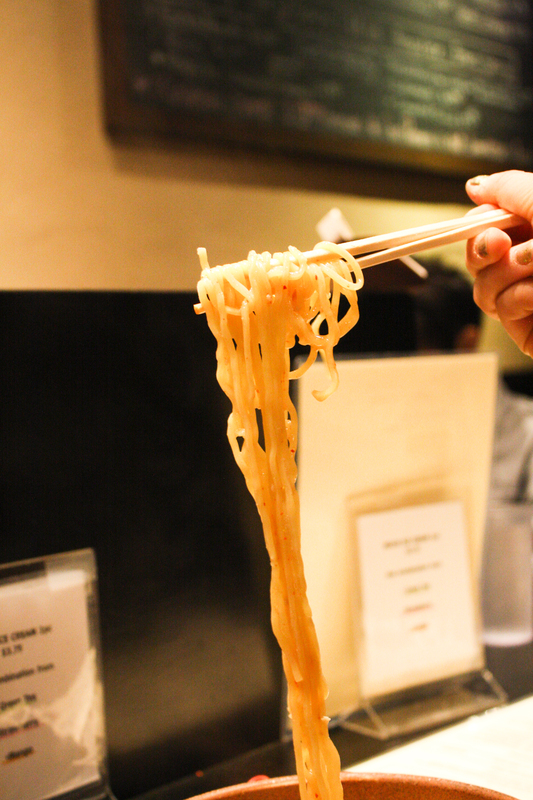 Our comfort came in the form of Namu Gaji’s limited-supply ramen, serving only 24 orders a day. A kimchi ramen (a popular stable back in the motherland, according to my Korean companion) with some unconventional toppings: hot dog and panko-cursted then fried egg. Needless to say, we had high expectations. The egg was a great touch: the panko crust soaked up the broth nicely, yet still maintained its crunch. The center of the egg was of course gooey and delicious. Ah, my golden melty sunlight of joy. But everything else fell a bit short. The ramen itself needed a bit more work and springiness. Might be the kimchi and the hot dog, but the broth felt a little dead with saltiness. Hot dog was a fun idea, but I wasn’t sure this would be its place. All in all, I thought Namu Gaji had great potential to be something truly wonderful. It was nice, but not quite enough. And at the price range offered, I felt that we should expect more. 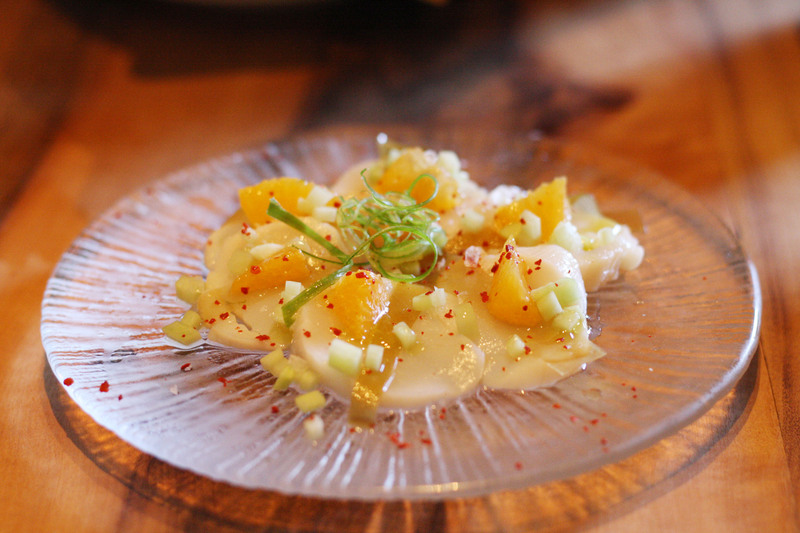 They were certainly capable of intricate flavor-building, manifested through the beautiful scallop dish. Maybe just more experimenting, and less hot dog. Wasabi Tonkotsu Ramen @ Ippudo. “The wait will be roughly four and a half hours.” Said the lady with minimal expression, as if a smile could hurt every facial muscle she possessed. I could see the smily chefs down the dark tunnel leading to the dining room area, working away at producing bowls after bowls of could-only-be deliciousness. It had to be, the wait was four and a half hours long. And so we wandered the city of New York, mainly the lower East Side. Bookstores, comic stores, the Christmas market, bars and coffee shops. Everywhere. Not a hidden gem missed. Four and actually fifty minutes later, we were in. In the spacious yet dimly lit room of huddled tables, leather-bound menus with too many options were passed around. 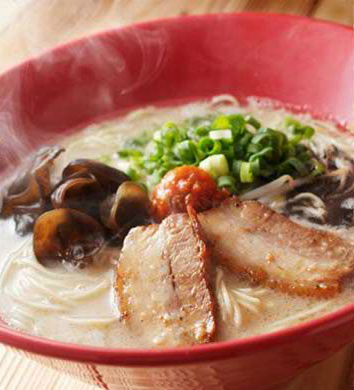 The official word on the web recommended the classic Shiromaru Hakata Classic: the original Tonkotsu – ramen soaked in white, cloudy broth made of pork bones and fat. 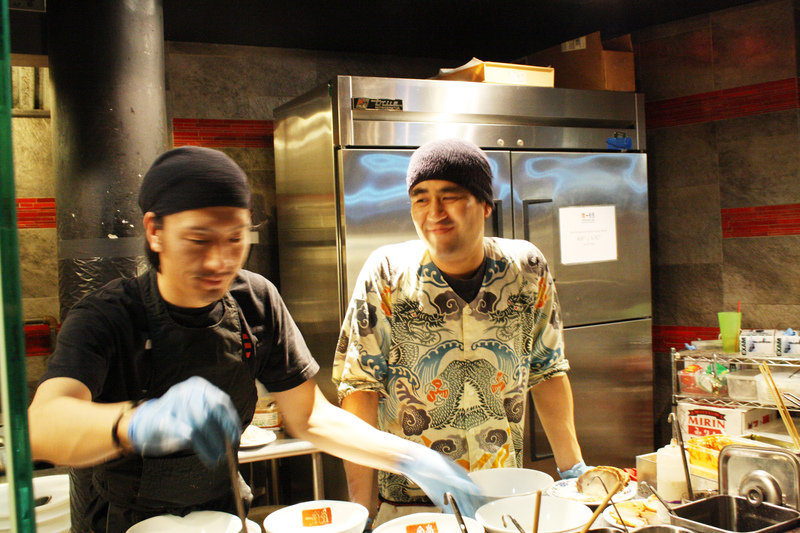 Danny claimed Akamaru to be the word – Tonkotsu topped with their secret ‘dama’, an additional sauce (the make-up depends on different restaurants) to be infused into the ramen broth. But I, always a sucker for Chef’s Specials, took the rebellious rout of Wasabi Tonkotsu. I may regret it later, I thought. Questioning my choice twice, thrice, four times as others took their turns to order. Yet, already in my mind’s make-up, the idea of a rich white broth balanced by a subtle hint of the green root couldn’t possibly disappoint. And it absolutely did not. 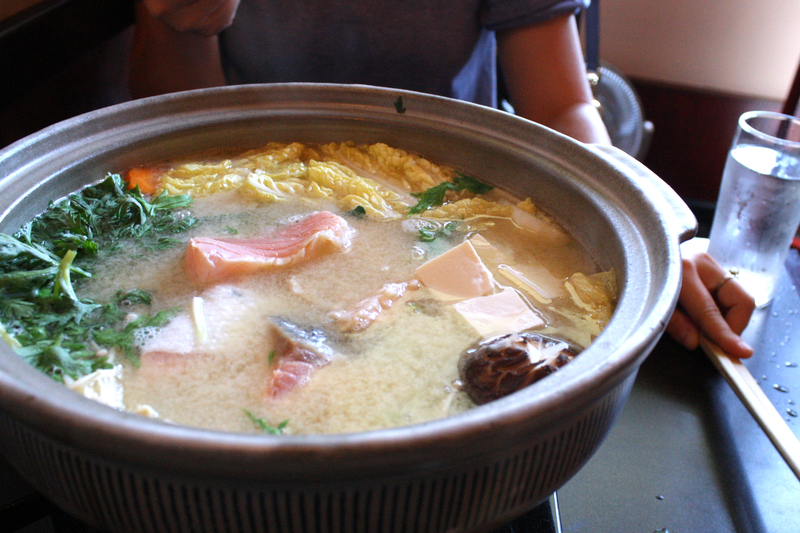 An otherwise rich and sometimes too heavy pork broth was cleansed by the shavings of fresh wasabi roots. 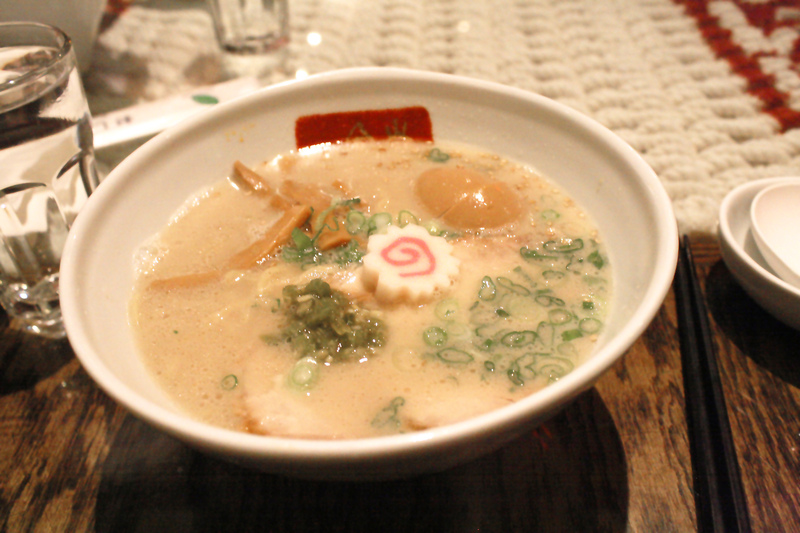 It was delightfuly clean without losing the body a Tonkotsu promised. The sprinkle of green onion provided an unexpected crunch, while the chashu – while thin – gave a burst of maximum pork favor. 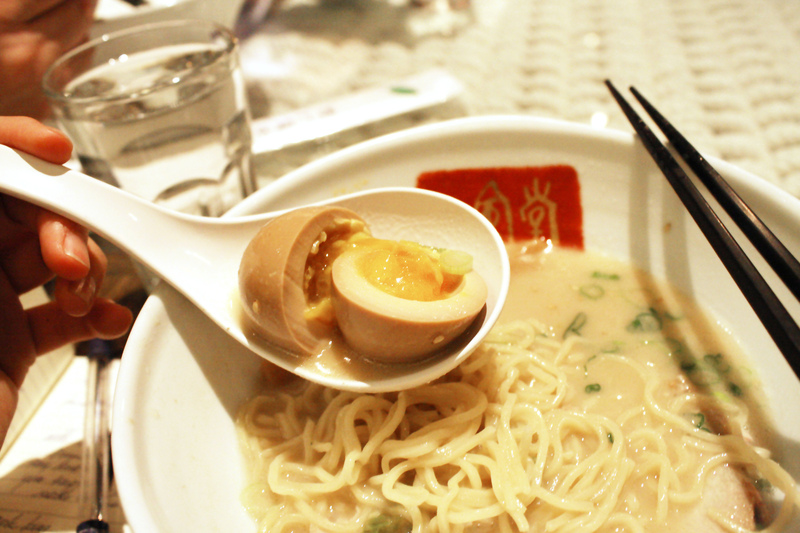 Swimming alongside was the extra-ordered onsen egg, softly poached to savor the golden yoke; no longer runny, yet still malleable – the ramen-optimal phase. The noodles was where I brushed up on the holy grail. For the many, too many, bowls of ramen I have ingested in the San Francisco, the noodles always slurped up nicely at first but fell limp 2/3 ways down the meal. 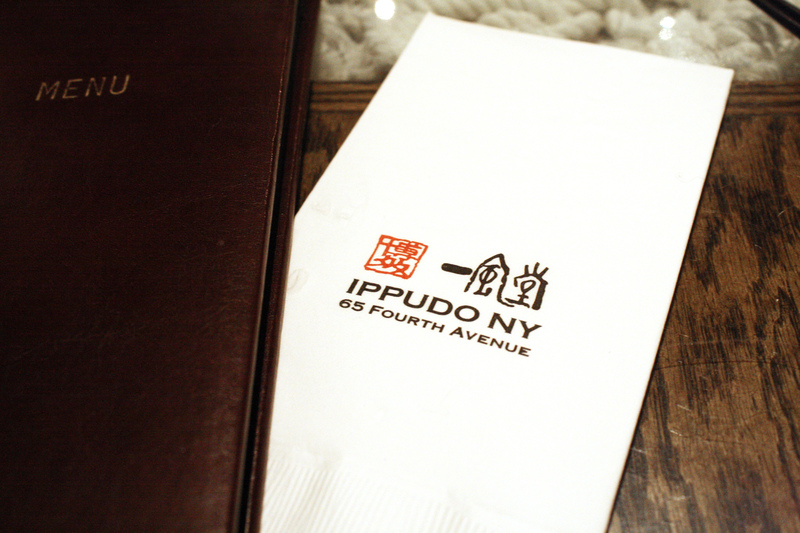 Not Ippudo’s. Perfectly springy, they became alive in my mouth like the most wonderful acrobat dancers, bouncy and full of life. For the 20 minutes it took me to finish the bowl, the noodles sustained their curves, never wavered even while I took time to admire other elements in the bowl. It was an amazing meal. 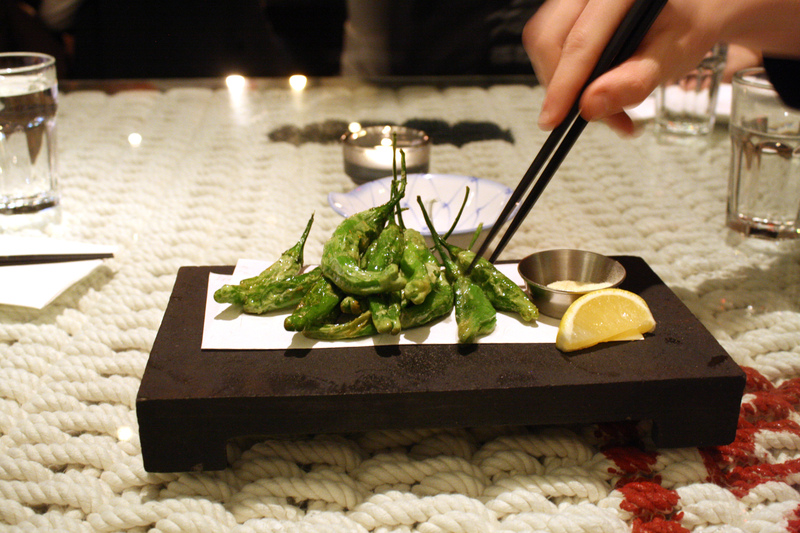 Not to say the fried shishito peppers dipped in yuzu salt – sweet, tangy, salty, mildly spicy – didn’t bring on a spring-filled surprise in a dark winter night; but the ramen stood supreme. 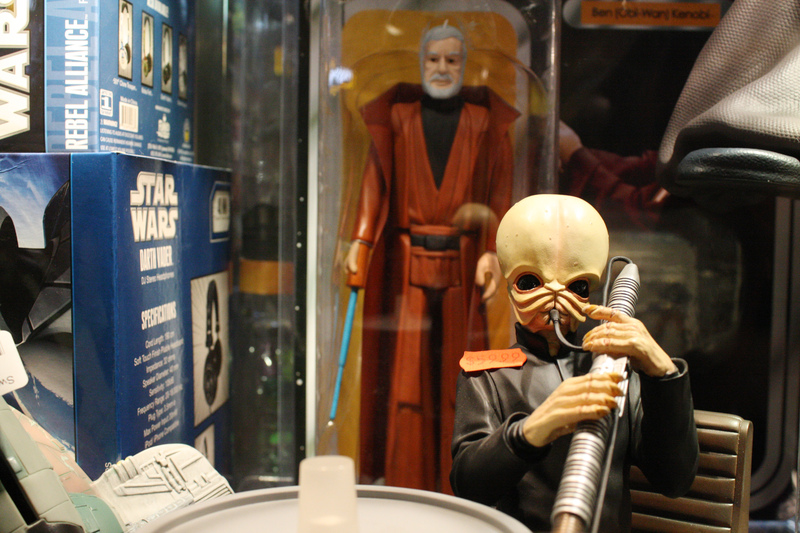 It was such a feel-good experience despite the near five-hour wait. A bowl of good ramen brought on this satisfaction nothing could quite compare. The only way to top this experience better may be if we were to ingest it Japanese businessmen style: standing, by the road, after way too much soju and chicken gizzard skewers. On our way out, we passed the expressionless front-of-house again. Unphased against a group of growingly agitated men, I heard her calmly stated: “The wait will be roughly one hour. But by the time you get your table, the kitchen will be closed anyway.” I admire you, straight-shooter. It was a super exciting day to be dining at Kappou Gomi, a Japanese restaurant in Outer Ricmond that I’ve been dying to try for about 2 years (but somehow never made to). 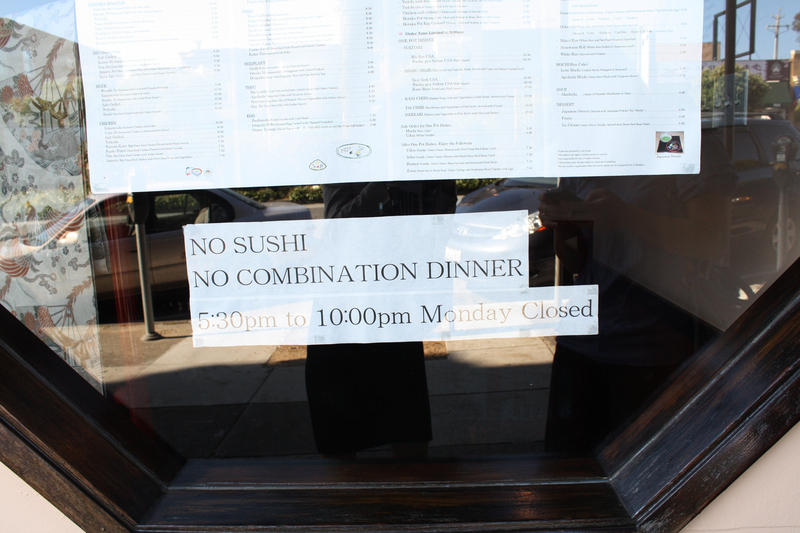 This was not the average sushi joint, as the sign in the window indicated. No sushi, no combination dinner. 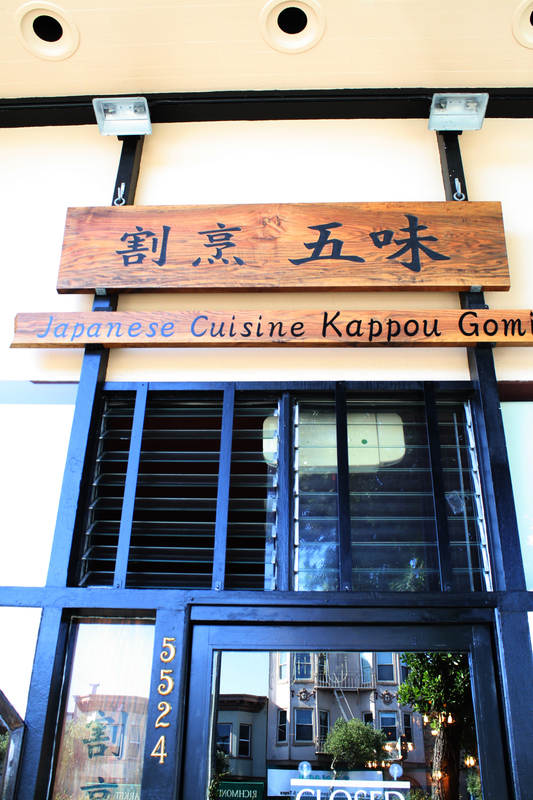 Kappou Gomi is a family operated joint serving authentic Japanese dishes that can be found in households and similar family restaurants in Japan. 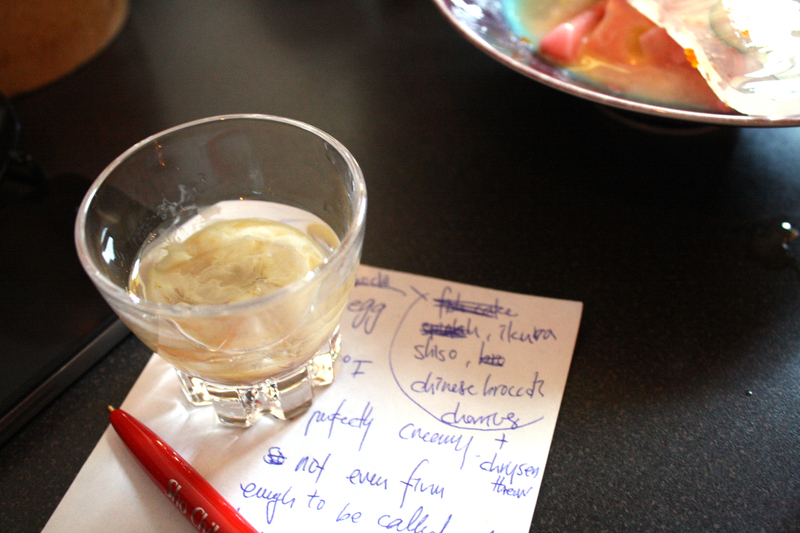 Upon arrival, seated at the bar, we were offered this 8-page menu detailing various proteins available as well as ways the ingredients can come prepared. kitty waited patiently as we look through the encyclopedia of a menu. Naturally, the first thing I noticed was an item on Today’s Special: konowata, also known as salted sea cucumber guts. 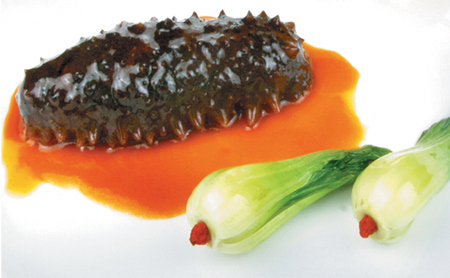 Sea cucumber is a marine animal that is often found on sea floors. It is referred as the sea rat in Japanese, looking a little like a headless version of Jaba the Hut. 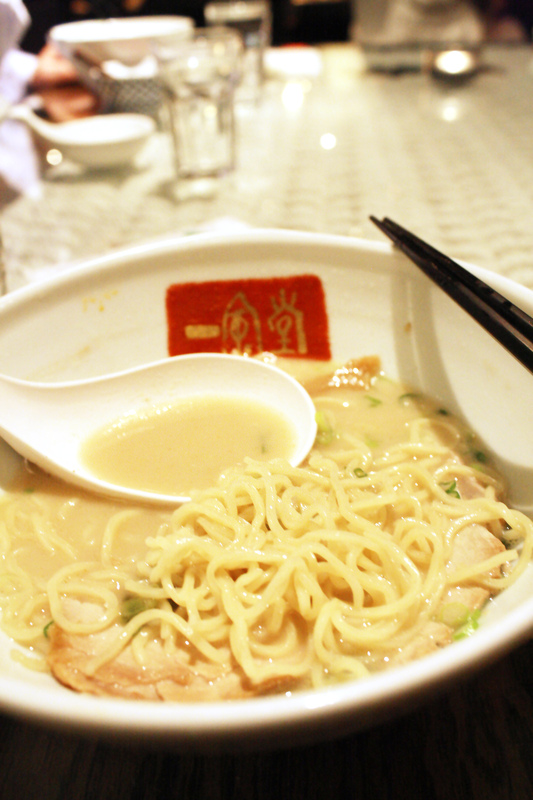 In Chinese cuisine, it is often braised in rich ham and scallop based broth, one of my favorite banquet dishes. That said, their guts was not something I was familiar with, I just hoped it would go well with sake. 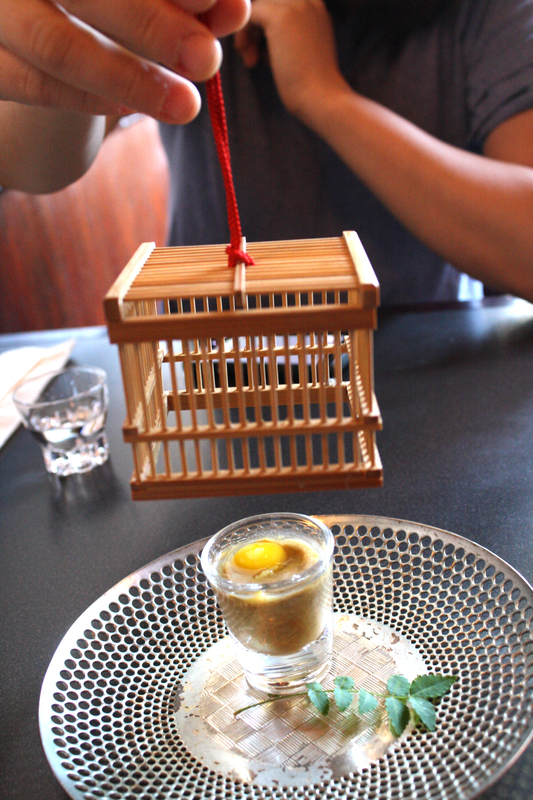 The waitress came with our order of sea cucumber guts, served on a beautiful silver plate, hidden in a small wooden cage. The brown, almost cloudy substance was what I had ordered. To prepare this dish, sea cucumber guts were taken out of the animal, mixed with salt and malted rice, then fermented for about a month. A common animal-gut based execution called shiokara. I mixed the egg thoroughly, hoping for the best. When I picked up the guts with my chopsticks, it was quite slippery to hold. The whole thing looked a little slimy, and tasted exactly that. The flavor was very intense: salty but with this familiar taste of the ocean that can be found in marinated pollock roe (mentaiko). It was overpowering at first, but really grew on me as I tasted it. Not only did the salted guts went well with my sake, it simply made me want to drink more! I mixed the last bit with some sake and just shot it. Actually quite delicious, almost comparable to oyster-vodka shooters. Our other dishes went tres bon with sake as well. There was this lemon juice marinated mackerel mixed with chrysanthemum, dressed in light wasabi, on top of pickled root vegetables (daikon, mini radish, lotus root). The fish was firm and zesty, clean in flavor with a tiny rush to the nose from the wasabi. The root vegetables sweet and refreshing. 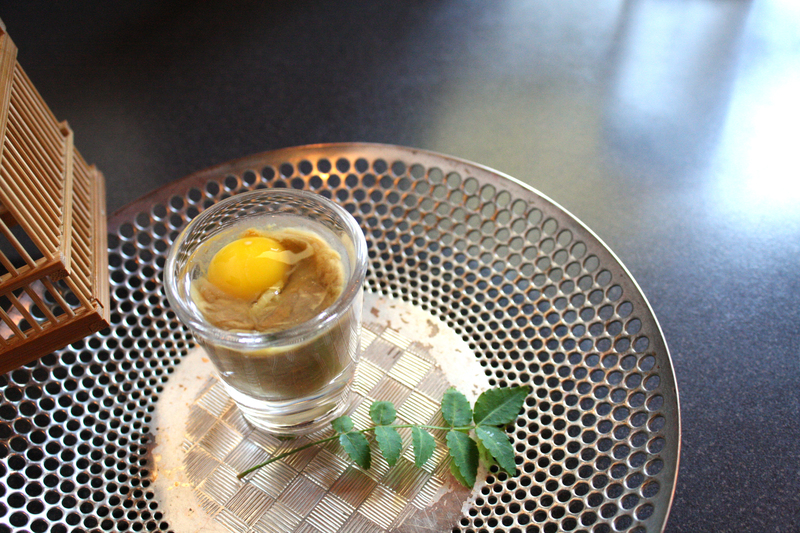 Then there was the onsen tamago, hot-spring egg. 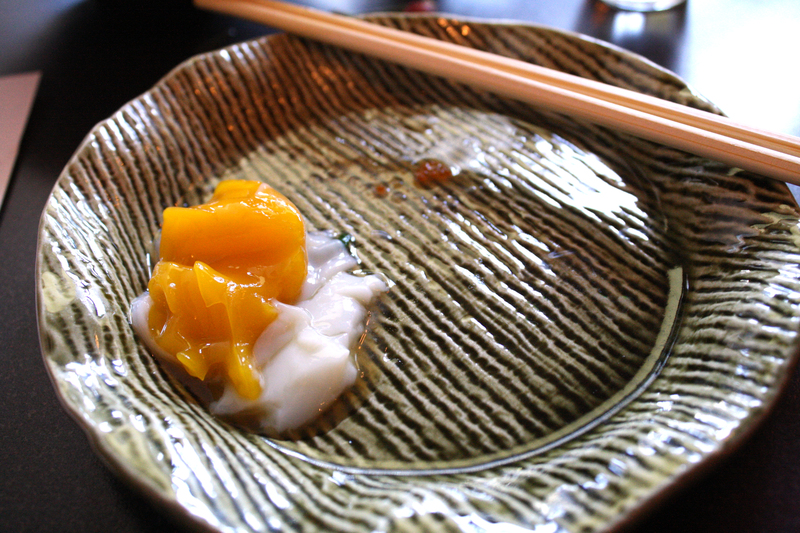 Boiled to perfection at exactly 159 degrees, the egg was served in a clean dashi, along with salmon roes, fish cake, shiso leaves, cherries, and a piece of Japanese isinglass on top. While the cherries were a bit odd (were they just looking to add something? ), the egg was terrific. Just look at it! The yoke was cooked so beautifully, so soft so smooth so sweet. It put all the eggs I’ve had before to shame, its magnificence and simplicity made me teary. 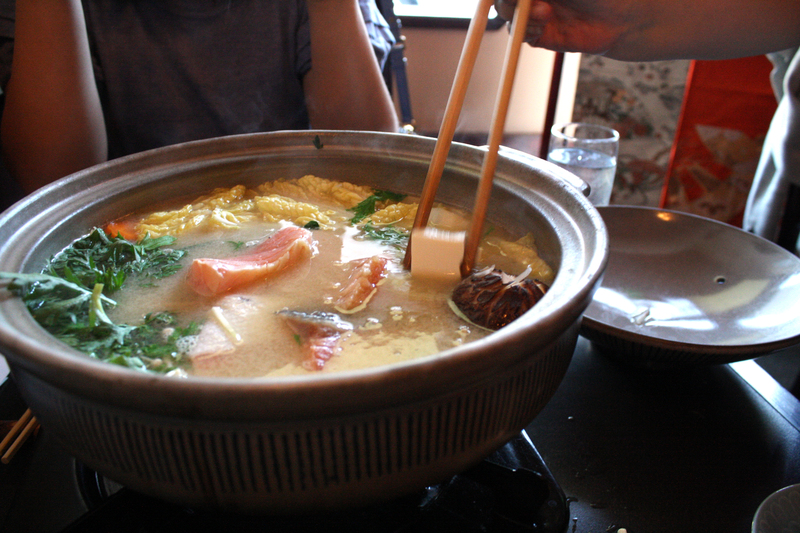 Of course, we ended with that dish that was too big to be served at the bar: ishikari, a miso-salmon hot pot. Sushi-grade salmon cooked medium in a boiling, rich miso both, along with some veggies and tofu. 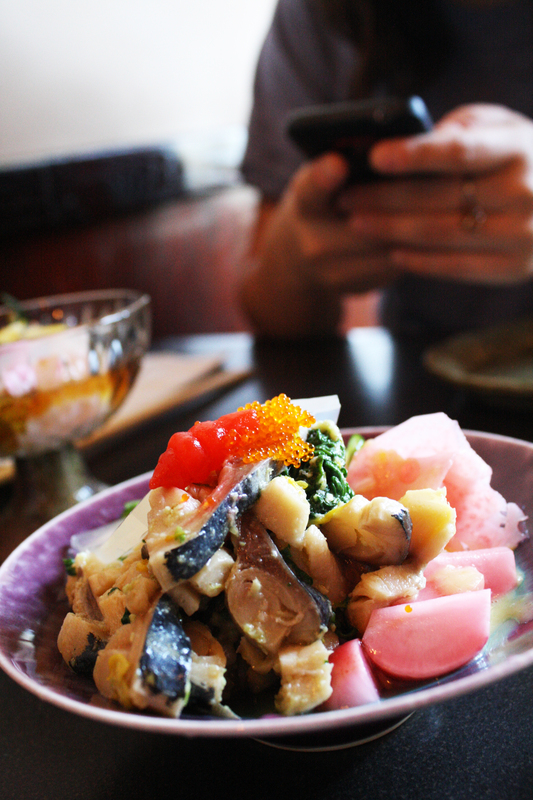 A fisherman’s food originated in Hokkaido. It was like a mother’s loving touch to our stomach, its warmth pleased us. Not a bad ending after some sake drinking. It made me think of the Japanese business men who would visit the roadside ramen stands after a few rounds of beer and sake and pickled small plates at local izakayas, looking to have something hot and satisfying before heading back home. Happiness, this was what it tasted like. Kappou Gomi, I shall be back. Soon enough. After a Memorial weekend of sausage and steak grilling, I thought I had exhausted whatever char-loving portion of my palette. Well, I was wrong. 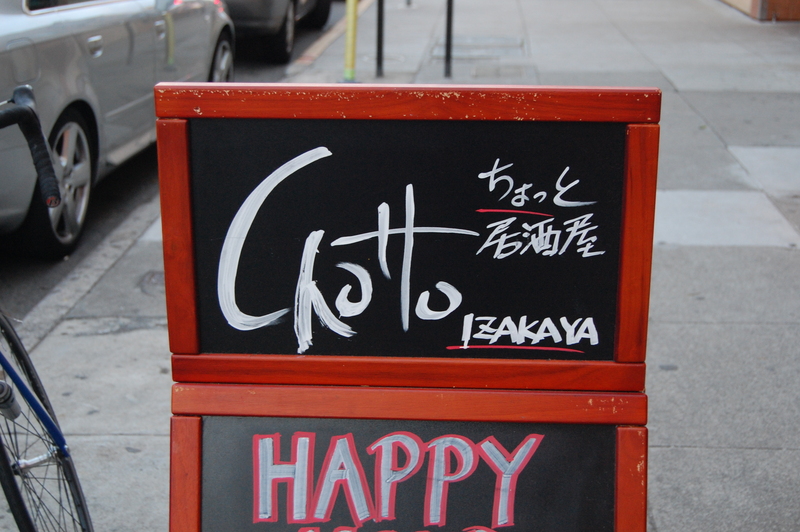 A breezy Monday evening, as if dragged by the insatiable ghost that is my appetite, I ended up here at Chotto, the local izakaya. Izakayas have been making the rounds in San Francisco, spreading from Inner Richmond through the rest of city like wild, ridiculously delicious fire. Chotto was among them. Set in the Marina, its menu was rather conservative at first. 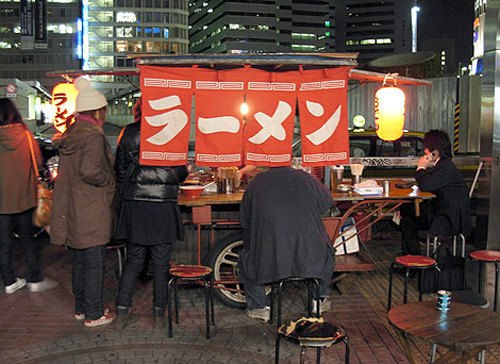 They offered Japanese bar bites in forms of raw dishes and skewered meats, but was careful not to intimidate customers with the more traditional variations such as gizzards and skins. But with its spring menu came bolder in their experimentation, testing the Marina waters with more unfamiliar ingredients. 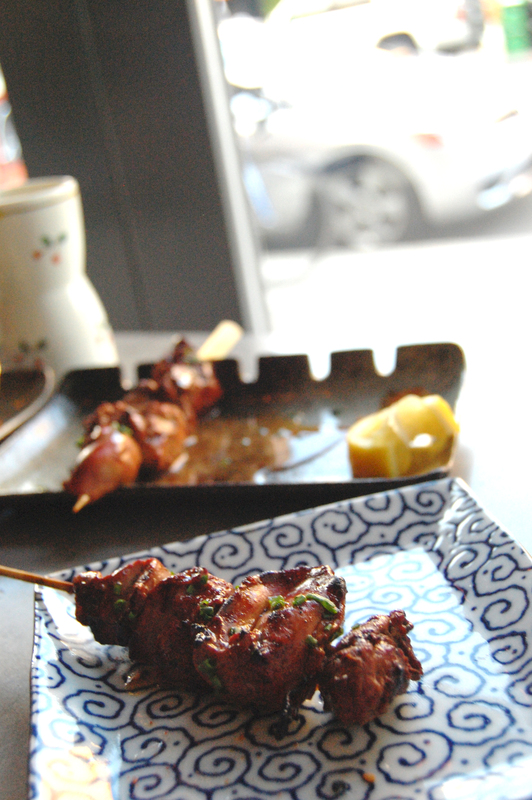 Such was the dish I came from: yaki tori motsu, grilled skewers of daily chicken parts. Lucky me, it was chicken liver day! 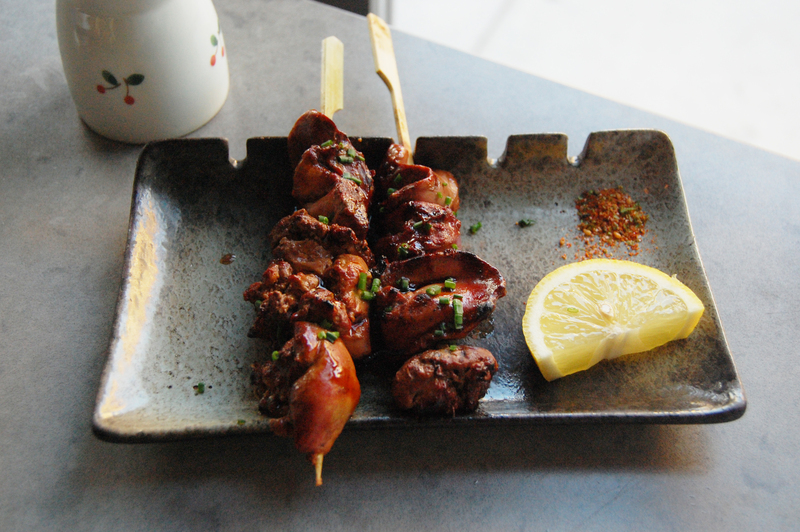 The two skewered grilled livers came to me oh-so-beautifully. Their skins were lightly charred, with a nice crisp around the succulent lobes of liver. 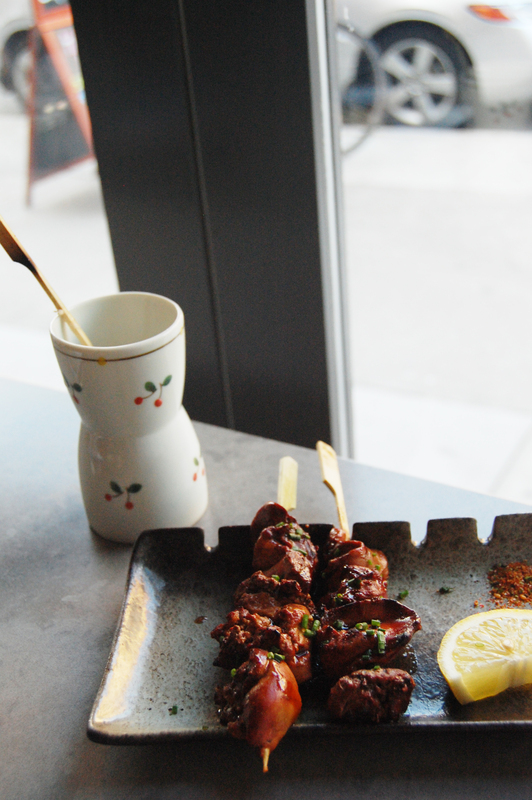 The skewers appeared to be only lightly seasoned; served on the side a wedge of lemon and a pinch of Shichimi, the Japanese “seven flavor chili pepper”. When I bit into it, I tasted the thinly crisped exterior, then into a cooked, slightly meaty layer. But that layer only lasted about 2 millimeters into my bite. 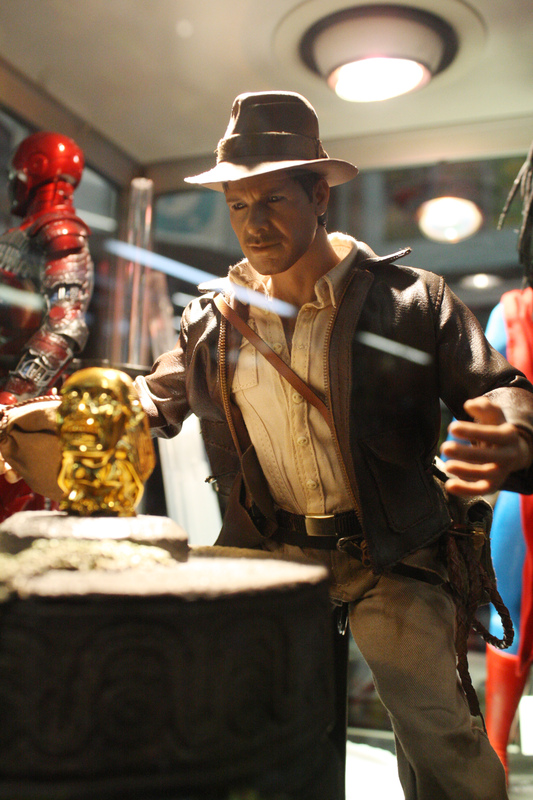 Then the lobe of liver bursted – literally – into a world of wonders. It had the texture between melted brie and the silkiest tofu – rich, creamy, smooth. Unlike the delicate flavor of monk fish liver, the grilled chicken liver was powerful, assertive, and full of life. While a piece of foie gets pan-seared carefully, these chicken livers were touched by wild flames and were re-birthed gloriously – straight into my belly. A slight squeeze of lemon and a tiny sprinkle of chili pepper brought the sweetness of the liver even further, rounding the flavors perfectly. 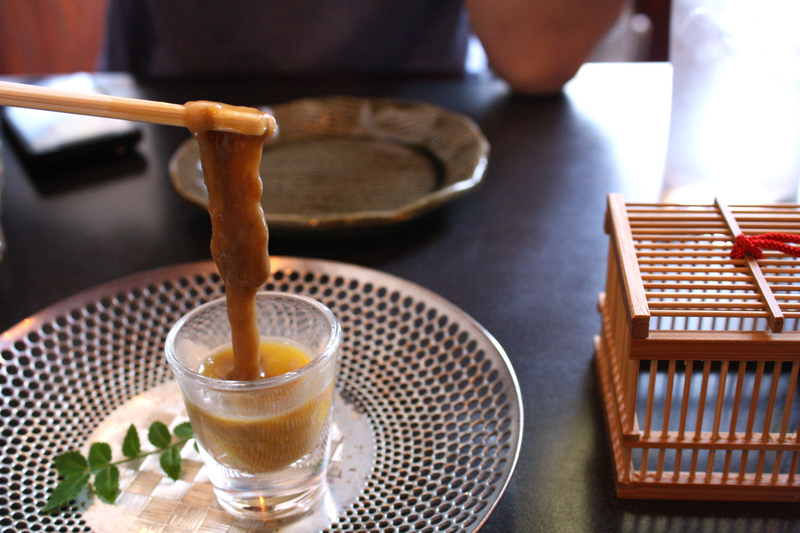 It was such a delightful experience from two not-too-tiny skewers of chicken livers. And yes, I ate them all. By myself. I’m not ashamed. 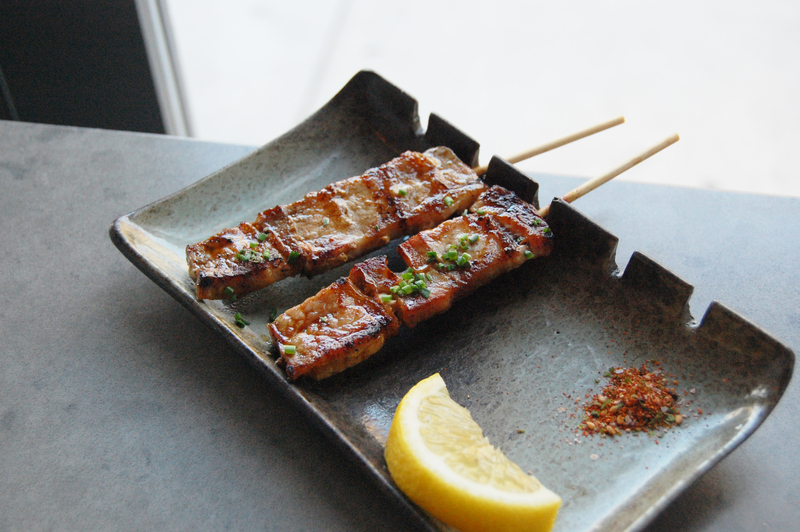 Bonus dish: the grilled pork belly skewers. It was firm and meaty, with tiny ribbons of fat in between. Delicious, and oddly refreshing; not something one would expect when the phrase “pork belly” was in the order. Yummy plus plus! Next up on my Chotto experience: grilled cow tongue! They unfortunately ran out for the day – by 7PM! It seems that weird eats is in vogue here by the bay. Though born Taiwanese, my favorite Asian cuisine is actually Japanese. It is one the celebrates the beauty of balance and subtlety, minimalist to the eye yet unravels layers of flavor upon tasting. 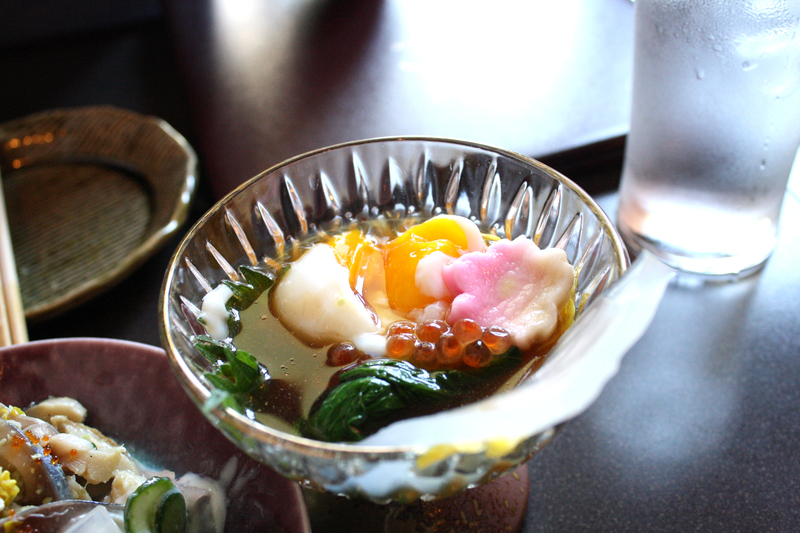 Rich yet delicate, is how I find Japanese food. 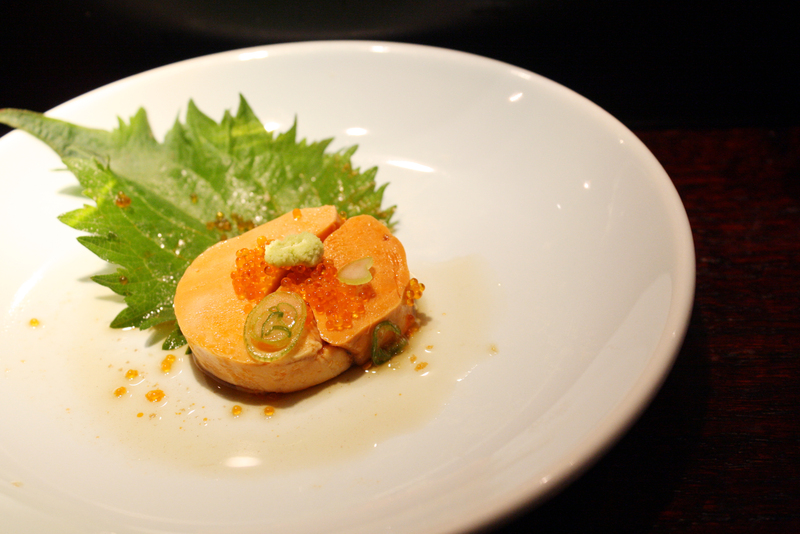 The very philosophy can be easily found in one of the common Japanese delicacies: ankimo, monkfish liver. My dish of the day at YamaSho, Japanese restaurant cross karaoke salon extraordinaire. To prepare this dish, the liver was first rubbed in salt, then rinsed with sake. It was then rolled in a cylinder to create the rounded shape, and steamed to be served. It came to me in gorgeous plating: slices of pink fish liver on top of a bright green shiso leaf, with a generous sprinkle of red, supple fly fish roes just winking at me all flirtatiously. 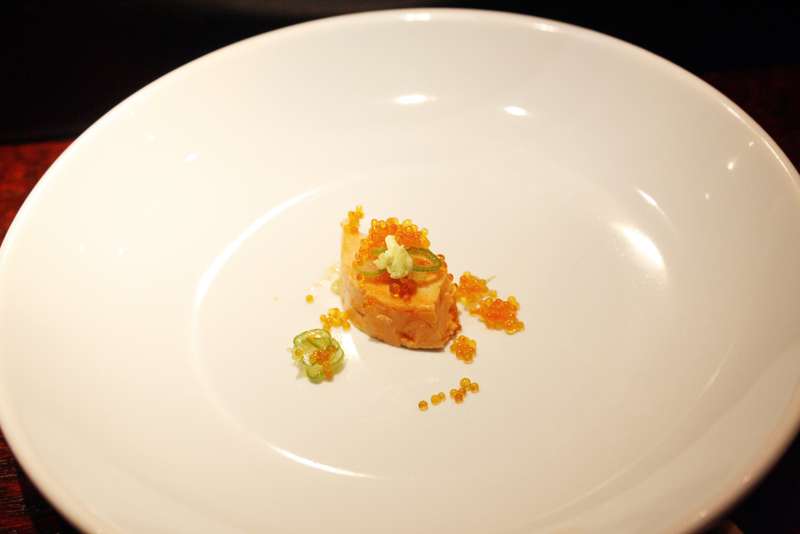 Just one bite was all it took to explain why ankimo is often referred to as the foie gras of the sea. It was rich, creamy yet light and delicate at the same time; without the heaviness found in duck or chicken livers, but just a hint of the ocean. 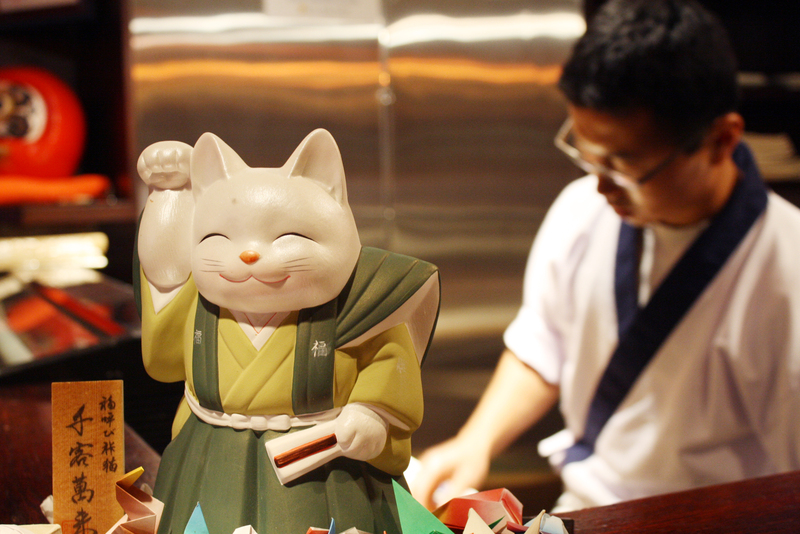 It presents the perfect balance that sang the ideology of Japanese cuisine. The texture was silky smooth, a great contrast to the squeaky pearls of roes. 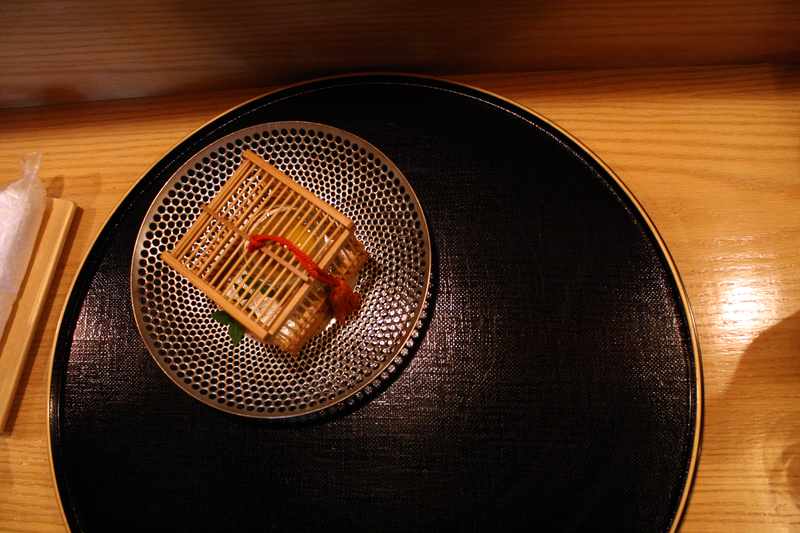 Though not served with the dish, I asked for a small dish of ponzu sauce. With the addition of this citrus-base sauce that resembles a very light mixture of soy sauce and yuzu vinaigrette, the monkfish liver suddenly came alive as if woken from a slumber. Whatever little stale heaviness that inevitably came with livers disappeared with the refreshing wash of citrus. It brought out this lovely sweetness that wasn’t quite there before. I am a huge fan of the right amount of acidity. Another interesting way to enjoy ankimo is by wrapping it with the shiso leaf and dip it in the ponzu. The coarse texture and aroma of this minty herb paired well with the monkfish liver. Now if only I had some grated daikon, everything would be soooo perfect. 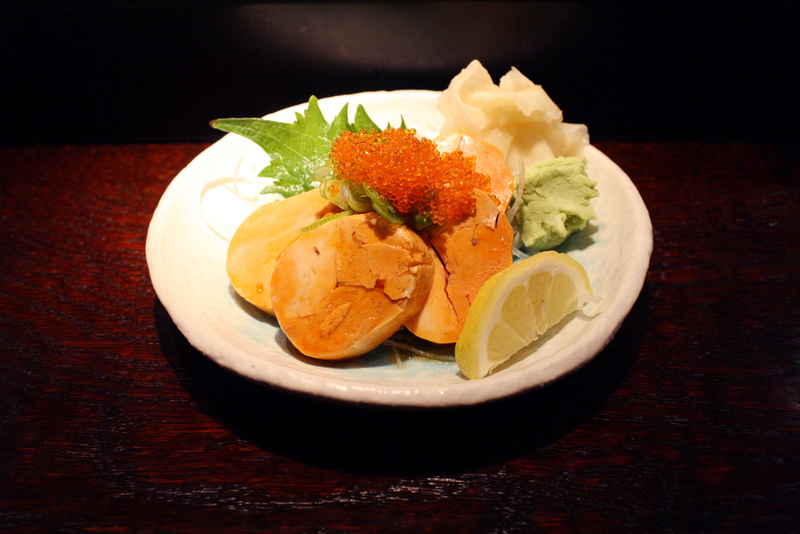 Monkfish liver can actually be found in most Japanese restaurants (at least in the Bay area). If you find the idea of offal still hard to stomach but feeling a bit adventurous, monkfish liver is quite the great “liver 101” into this mysterious world. Give it a try!